SMFM strives to be inclusive and to meet the needs of our members. In response feedback from 2018 Annual Meeting attendees, we are expanding resources for families at The Pregnancy Meeting™ in 2019. Childcare Services: PRE-REGISTRATION REQUIRED. We are offering childcare services at the Annual Meeting. This is a pilot program, sponsored by UT Health McGovern Medical School and subsidized by SMFM. It is limited to 10 children per hour on a first-come, first-served basis. Registration is open until January 11, 2019. This registration deadline is in place so that Kiddie Corp, the company contracted to provide the childcare services, can ensure they have the right staff and equipment in place. To register for childcare, please click here. For more details about how this will work, please see our FAQ document. Nursing Mother's Room (Dads are Welcome, Too): Baby-wearing and feeding is welcome throughout The Pregnancy Meeting™. For those who prefer private space, we will have a room for mothers to pump or feed children. For the first time ever, we will also use the Nursing Mother's Room as a place to soothe a crying baby or just to burn off some energy for a rambunctious toddler. This space is open to dads with children, too! The room will have private, separate places for pumping/feeding and an open area for play. It will also feature live-streaming of the plenary sessions so parents don't have to miss a thing! 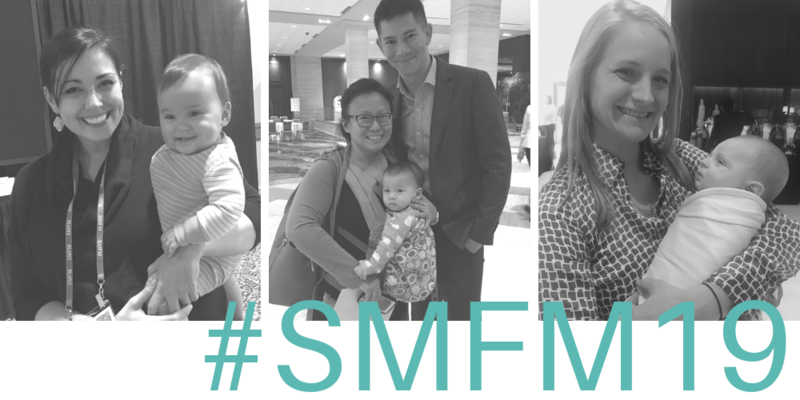 Social Media: Join our members-only Facebook group to be the first to know about all-things SMFM. Use the hashtag #SMFM19 on Twitter, Facebook and Instagram for information specifically related to the 2019 Annual Meeting.